The New England Paranormal Awards celebrate and reward the hard work of individuals and teams who dedicate themselves to bringing awareness and education to the public about the world of the unknown. The Paranormal Awards nominees were judged on their professionalism and dedication. Cynthia began investigating the paranormal because of experiences she had her entire life. In 2011, Cynthia founded the New Jersey Paranormal Group (www.NJParanormalGroup.org), which is dedicated to the research, investigation and documentation of paranormal phenomenon. Comprised of believers and skeptics who are out to prove or disprove the existence of paranormal activity, the group uses both metaphysical and scientific methods. She is also the author of www.OriginalCynPI.com, a blog site dedicated to sharing her experiences and evidence from investigations she has been on over the years. 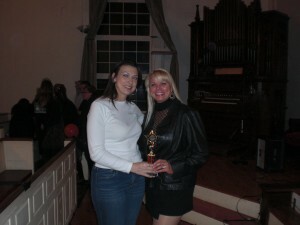 She also educates the public about what she does as an investigator and about the paranormal.